Last January, in an article about Abby Brockway, John Fife was quoted as saying that Presbyterians are good at reform (in fact we are legendary for it), good at charity (we are a shirt-off-our backs denomination), good at advocacy (we are bright, articulate, politically savvy people) and it isn’t enough. He says we have to take the next step and resist. Rick Ufford-Chase is leading the way with his new book entitled Faithful Resistance. Both moderators of PC(USA) are urging us to a new level of engaging the problems that thwart our earth. Furthermore, at our last PEC conference, Rev. Dr. J. Herbert Nelson challenged us to get out into the streets. As the Advocacy arm of Presbyterians for Earth Care looks toward the next conference in Portland, Oregon, it wants to seriously consider the admonitions of these church leaders. It is no longer good enough to come together and speak/listen to the issues. We already know the issues, don’t we? Let us then explore the next step—let’s learn resistance. The people who taught John Fife and Rick Ufford-Chase flowed over the southern border of our country. The teachers we can listen to and act with in Oregon are waiting for us to come and experience their challenges. For the last two years we have focused on water and how it has been changed by the use of fossil fuels. Now we want to take that lens and turn it just slightly. Those who can teach about resistance live by the rising waters, the growing deserts that lack water, the places where the water from their tap smells of gas, places where dams have stopped the fish from returning, places where ice no longer forms in the winter to buffer their communities from the battering of fierce storms. It is their stories that we must hear and their directions we must take. We have skin that is not the same color as theirs. We have privileges that distance us from the realities of their lives. They have much to teach us, we have much to learn. Resisting together, respecting, finding the common ground of our shared humanity—that is the next step. PEC, through our Advocacy Committee and our Sept 26-29, 2017 Portland conference planning team, is beginning to gather stories -- names, and places of persons affected by climate change and erratic weather patterns. Nan Fayer, our SE Regional Representative, shares her recent weather/water experience. It began as an easy, hazy, sultry but relaxing evening in late July 2016. My husband and I were enjoying a tasty dinner with good friends at a quaint, stone- walled restaurant in historic Ellicott City, Maryland. A block away the Tiber and Hudson creeks converged and joined to form the Patapsco River, where three Quakers, the Ellicott brothers, established a community by 1775, and harnessed the energy of the river to provide energy for their flour and lumber mills, halfway between Baltimore and Washington, DC. Then, within an hour that night, everything in Ellicott City changed. The rain came in torrents. For the next two hours the sky poured 6 ½ inches of rain, a once in a 1,000 years storm. 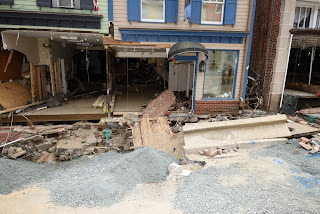 The once-peaceful scene on Main Street became the channel of a raging flood 15 feet deep, which undermined the street and sidewalks, destroyed ten buildings and took two lives. The storm, in its wake, left cars, homes, businesses and livelihoods in broken bits. My husband and I were among the lucky ones. We did not have to be evacuated because we left the restaurant a half an hour before the flood trapped people there. However our car was totaled, along with more than 200 others parked on Main Street, which were trapped among the debris, or floated into the river. As Ellicott City residents and volunteers tackle the long work of clearing out the debris, cleaning up and rebuilding infrastructure, the long term impacts of the flood become more evident. I wonder what will happen to vulnerable people in the flooded areas of Ellicott City who aren’t being helped and whose stories aren’t being told. Among them, the minimum-wage earners who worked in the many locally owned little shops and restaurants. Even before the flood, they struggled to make ends meet. What will happen to the servers who led diners safely to the second, and then the third floor of the restaurants as the water rose, only to realize that they themselves had lost their livelihood, their car, and for some, a place to live? This flood is not just a local or short-term concern for the three mile radius of Ellicott City. Its impacts are present in other areas of the County as the precious and finite amount of potable water is released or redirected according to climatic conditions. When Ellicott City or other river and coastal towns are inundated with intense rainfall, other parts of the country are receiving less rain and are becoming parched and tinder dry. When natural disasters occur, disadvantaged populations are especially imperiled. In floods or in drought, may we serve as people of faith, integrity, foresight, and courage. PEC is grateful for our colleagues in creation care, Revs. Bruce & Carolyn Gillette, co-pastors of Limestone Presbyterian Church in Wilmington, Delaware. They are consistently generous in sharing the fruits of their creative ministry both through liturgical resourcing, contributing and supporting overtures - including On Amending “The Ministry of Members,” by adding “Caring for God’s Creation - and through hymnody in eco-justice. Bruce and Carolyn have compiled the resources below hat include a reflection from Dr. Bill Brown and a beautiful litany they have written that blends the Lord’s Prayer with concern for God's creation. People: You created us, you made this world, and you called your creation very good. Yet often we forget that you are our loving Parent who continues to bless your world. People: Yet we fail to live in awe of you. We take you for granted, and we don’t see the awesome beauty of the world you have made. People: We confess that our reverence for you does not always lead us to care reverently for your earth, sky and sea. People: We confess that we often put our own interests first—exploiting your creation, and living for our own convenience and self-interest. People: We confess that we consume more than our share of the world’s resources, while billions go hungry every day and your whole creation suffers. People: We confess that we see these words only in spiritual terms, while the Bible is filled with teachings about economic justice and creation care. People: Help us to resist the temptations of spending more, using more, acquiring more, and wasting more. People: Free us from greed and self-centeredness that separate us from you and others. People: Help us to know that in caring for your wonderful world, we are working for your kingdom, being good stewards of your creative power, and giving you glory. People: We end our prayers with “Amen,” a word that means “let it be so.” We know we can be faithful disciples by your grace. Amen! Creation reminds us, O God, of your love. We’re called to be stewards, your caretakers here. Your rainforests nurture the world that we share. Your wetlands give animals shelter and care. Your coral reefs cradle the life of the sea. You’ve shown us, in love, what your good world can be. Too often, O God, we abuse your good earth. We fail to remember its beauty and worth. We threaten your world through indifference and greed. And lovingly cares for this earth that is yours. Biblical References: Genesis 1- 2, Psalms 8 and 24. The hymn is available online with the music as a free download. You are present in the whole universe and in the smallest of your creatures. You embrace with your tenderness all that exists. Encourage us, we pray, in our struggle for justice, love and peace. Amen. “Laudato Si’ (“Praise Be to You”): On Care for Our Common Home,” 2015 Encyclical Letter of Pope Francis. The fundamental mandate for creation care comes from Genesis 2:15, where God places Adam in the garden to "till it and keep it" (NRSV). A better translation from the Hebrew is "to serve it and to preserve it." In Genesis 1:26-28, God blesses humankind with dominion over the earth. This acknowledgement that humanity is the most powerful species on earth does not, however, give license to dominate and exploit the planet. Indeed, the following verses affirm the right of animals to share in the bounty of the earth's produce (Gen 1:29-30). Human "dominion" as intended in Genesis is best practiced in care for creation, in stewardship, which according to Genesis Noah fulfills best by implementing God's first endangered species act. More-over, the great creation psalm of the Psalter views humanity as one species among many animal species, all meant to flourish together (Psalm 104:14-23). The psalmist exclaims, “O LORD, how manifold are your works! In wisdom you have made them all; the earth is full of your creatures” (v. 24). Scripture affirms that God created the world in wisdom and out of love, and it is also out of love for the world that God gave Christ to redeem it (John 3:16). In Christ “all things hold together” (Colossians 1:17), and “every creature under heaven” is to receive God’s good news (v. 23). According to Revelation, God’s work in the world is “make all things new” (21:5), to bring about a new creation that does not destroy the old but transforms it, renews it. If the church is the sign of the new creation, then the church must lead the way in caring for creation. God calls the Church in the power of the Holy Spirit to participate in God’s work of creation and preservation. God has given humankind awesome power and perilous responsibility to rule and tame the earth, to sustain and reshape it, to replenish and renew it. e. use and shape earth’s goods to create beauty, order, health, and peace in ways that reflect God’s love for all creatures. In gratitude for the gifts of creation, the faithful bring material goods to God in worship as a means of expressing praise, as a symbol of their self-offering, and as a token of their commitment to share earth’s goods. (W-2.5000; W-3.3507; W-5.5005; W-5.6000). Kathleen Murphy is one of the newest Eco-Stewards having participated this summer in the Seattle trip. When she returned home, she kept the momentum going by rallying against a corporate pipeline (Mountain Valley Pipeline) to be constructed in her home state of Virginia. It’s easy to get bogged down by the enormity of it all. The doomsday predictions, the destruction of our natural resources, conflicting interests furthering stereotypes of supporters on each side, and most of all - the feeling of being so small that you, one individual, cannot make a difference and your voice will be drowned out by all the noise. When we feel overwhelmed it’s easier to retreat, simply throw up our hands and say the problem is too big. The noise is deafening. Who will hear me, even if I yell? During my time with the other eco-focused young adults on our Eco-Stewards trip to Seattle, I learned many things that continue to shape my perspective and daily habits. We met with members from the Lummi Nation, a Native tribe living in the far northwest portion of Washington State. The Lummi have been in this area of Washington for generations and are very connected to the waterways in the area, mainly the Salish Sea. 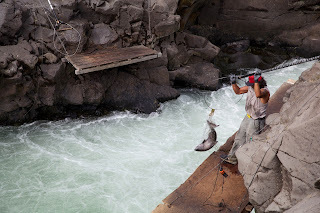 These waters are sacred fishing grounds for the Lummi. The immense respect their people have for the water influences the life of the tribe and the life of each individual. This respect, sadly, is not a part of the culture in corporate oil and coal export. 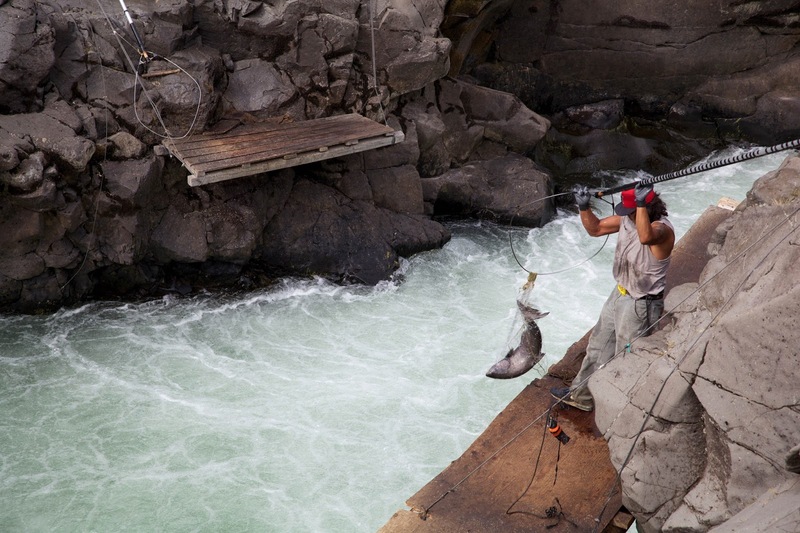 Corporate interests have pillaged the Lummi’s sacred waterways for oil and coal. Luckily, the Lummi were courageous enough to fight, and defeat, plans to install another massive export facility. Corporate interests plan to do similar things here, in Virginia, by building a natural gas pipeline that runs through some of Virginia’s most pristine mountainous landscapes. 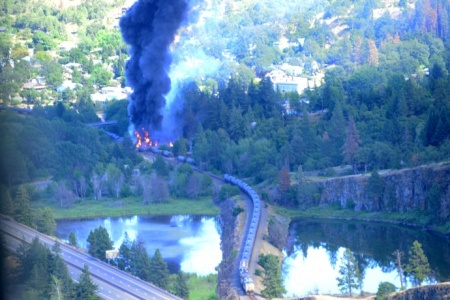 Our governor has decided to support the pipeline to the shock and disappointment of many citizens. Our disappointment turned into action. 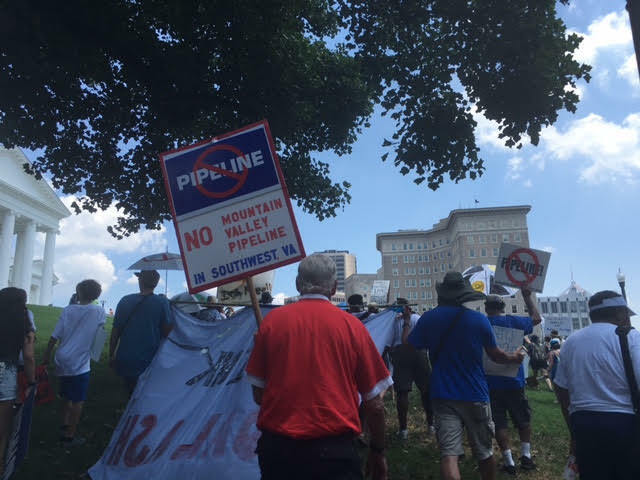 A number of community groups and non-profits organized a “March on the Mansion” to show our opposition to the pipeline. Even on a 98-degree day, with the heat index well over 100, we took to the streets of Richmond in a physical manifestation of resistance. Conservative estimates say the crowd was 600 strong. I think it was more. We marched from the James River, which is being polluted by the region’s electric utility monopoly, past the electric utility’s headquarters, through Capital Square to the Governor’s Mansion. We were loud, we had signs, we had community. When you think that the noise is too loud for you to be heard, do not retreat. This is too great an issue to retreat. God’s Creation is at stake. So, when you feel like you will be drowned out, join others and yell together. The sum of all of our voices can, and will, overcome the noise. In 2010 Oberlin College celebrated the 10th anniversary of the Adam Joseph Lewis Center (AJLC) for Environmental Studies. Architect Magazine recognized it then as the most important green building constructed in the last 30 years. 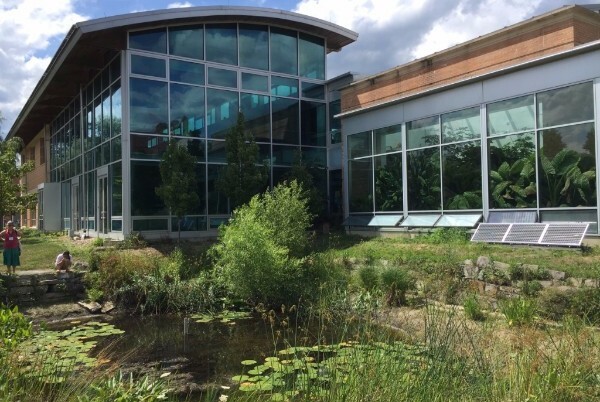 Besides such sustainable choices as solar and geothermal energy provisions and recycled and biodegradable materials, the building features a “Living Machine.” This is an ecologically engineered system that combines elements of conventional wastewater technology with the purification processes of wetland ecosystems—plants with roots supporting living bio-filters like snails and bacteria—to treat and recycle the building’s wastewater. A weather station monitors real-time conditions and trends for a variety of environmental variables. The landcape is an integral part of the AJLC; it includes an orchard and permaculture garden, paths, and benches. Colin Koffel, an Oberlin graduate, portrays the building’s wide educational reach: “The Lewis Center isn’t just home to environmental studies. 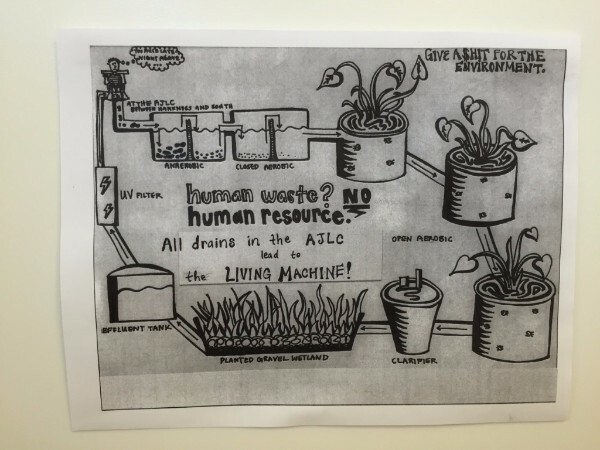 I also took classes in economics and cinema studies there, and it helped bring discussions of sustainability into those fields.” The building, true to its inclusion of community input since the beginning, has become a center for many local events. Clearly the design team led by William McDonough + Partners created a building that will adapt and change as more sustainable, hopeful solutions unfold.